This recipe is adapted from one of my favorite cookbooks “The Gluten Free Almond Flour Cookbook” by Elana Amsterdam. Elana’s website is also an awesome source for going gluten/wheat free. You don’t have to be celiac to go gluten free. More on that under links. This makes 8-12 small pancakes, enough for two. You can easily double the recipe. 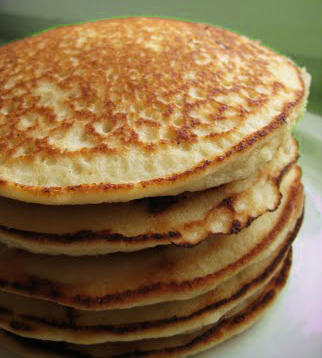 These are best made very small, as flipping them is a bit trickier than the standard pancake! They are so good my 25 year old son ate all the ones in our freezer! * Unlike cornstarch or flour, arrowroot powder has a completely neutral taste. In a blender, combine the eggs, honey, vanilla, and water, process on high for a minute until smooth. Then, add the almond flour, salt, baking soda, and arrowroot powder, blend until thoroughly combined. You will need a small ladle to place the batter on the pan and a scraper to get the batter out off the sides. You may want the batter to sit for 5-10 minutes to thicken up. It will be thick, and you’ll need a scraper to get it out of the blender. I served these with bacon for a pretty filling and low carb breakfast on weekends. You can, if carbs aren’t an issue, serve with raspberries (2 pints with ½ cup orange juice cooked down to a sauce) and fresh blueberries, or you can use maple syrup, (100% ONLY) but realize that adds sugar. Enjoy! The Reverse of Super-Size me and it’s lessons for us.